Last night the Boston Final Cut Pro User Group hosted the 2nd annual Boston SuperMeet at the Stuart Street Playhouse in downtown Boston. It was a dark and stormy night, with the threat of the first snow of the winter, so it was a great night to be indoors with a bunch of other video production nerds. My coworker, Kevin McGowan, and I arrived about an hour and a half before the show so we could walk around the exhibit floor and visit some of the vendor booths. I don't have any hard numbers, but it seems like there were more vendors this year than last year. It's a great opportunity to talk to some company reps and get some hands-on demos of gear and software. Around 7pm we all headed into the theater to start the show. Hosts Daniel Berube and Michael Horton put together a great lineup for the Masters of Light and Illusion theme. I'm sure there will be video from the evening posted on the FCPUG SuperMeet YouTube channel, so I'll just post some pics and highlights from the evening. First up was Alexis Van Hurkman with a DaVinci Resolve demo. I'm always reminded of how little I know about advanced color correction when I watch demos from pros like Alexis. I think I'm finally motivated to download the free DaVinci Resolve Lite and try my hand at more advanced color correction. A couple of weeks ago Canon announced their latest flagship DSLR, the EOS 1DX, and Jem Schofield was at the SuperMeet to talk about using that camera for video production. Wonderful looking specs on that camera, but unfortunately I don't have $6500 to drop on a body. My real takeaway from Jem's talk is that I'm now turned onto his great website/blog, theC47. Some interesting tutorials on there. He said he has achieved his goal of posting five video tutorials per week! Jem closed by hinting that we should all pay attention on November 3rd for an important announcement by Canon. A 4K video camera, or a 5D refresh? We'll see. Our next demo was an Autodesk Smoke demo from Marc-André Ferguson. This must be the seventh Smoke demo I've seen, and my opinion is still the same: it looks like a very powerful program, but just too much for what I'm doing. For those working in high end video/film production, I think this is a great program packed with features they will use. As always, I'm still baffled about the choices Autodesk made for the user interface on Smoke. Maybe once you use it regularly it starts to make more sense, but I just see it as a pretty uninviting interface to work with. With so many video production pros giving up on Apple because of the Final Cut X mess, Avid seems to be welcoming all Final Cut converts with open arms. Our next demo was an Avid Media Composer 5.5 demo from Corey Tedrow. Avid always does a great job of pointing out all the Media Composer features that people were wishing for in the new Final Cut X. The statement that got the biggest reaction from the crowd was the announcement that you can now export ProRes files directly from the Media Composer timeline. With a handful of discounts being offered by Avid, I'm sure many Final Cut users will find themselves trying out the free 30 day trial version of Media Composer. The next presenter was an Avid sponsored talk from film editor Andrew Weisblum (Black Swan, The Wrestler, Fantastic Mr. Fox, The Darjeeling Limited). Andrew showed us the nightclub/drug scene from Black Swan and described how Avid products helped him collaborate with others in finishing that scene. Our final presenter of the evening was Walter Murch. His resume is loaded with plenty of well known films, but some of the biggies he's edited are: Apocalypse Now, The English Patient, The Talented Mr. Ripley, Jarhead, and Ghost. I was really pleased to hear that he edited what I believe to be the only acceptable 3D film: Captain EO. I wasn't a film major, so this was the first time I had attended a talk from a major Hollywood film editor. I was surprised at how grounded Walter is. With all the major films he's worked on, and all the awards he's won, he could have easily turned into another Hollywood type with a major ego. Instead I got the total opposite impression from him. There was a kind of complex simplicity about Walter. I started to forget that I was listening to a three time Oscar winner when he began telling us that it's important to put one foot on a stool while editing to reduce lower back pain. I also liked the fact that Walter obviously has a wonderfully creative mind, but he's also very in touch with the technical aspects of editing. He really enjoyed telling us about the Arri Alexa that they used on his latest film, Hemingway & Gellhorn. I was very impressed with a picture of his Final Cut 7 timeline from that film (pictured above). 22 video tracks and 50 audio tracks is a project that I just can't wrap my head around. Walter also showed us a photo of one of his famous standing editing stations. He really attested to the idea that standing opens him up for a more creative workflow, rather than losing creative energy sitting at a desk. Walter concluded his talk with mention of the new Final Cut X. He described it as a child that doesn't play well with others. He said that in June he sent Apple a letter outlining why he wouldn't be able to use Final Cut X on his projects. Walter's biggest complaints were the restructuring (aka lack of) audio tracks, no external monitoring and no SAN support. He admits that they're slowly resolving those issues, but he was also concerned that Apple essentially killed off Final Cut 7. If you would like to read a more detailed blog post about Walter's SuperMeet talk, Chris Portal wrote a nice post. The evening concluded with the famous SuperMeet raffle with over $50,000 in prizes. Unfortunately, just like at the Vegas NAB SuperMeet, my coworker and left empty handed. Once again, Daniel Berube put together an enjoyable Boston Final Cut Pro User Group meeting and SuperMeet. If you live in the Boston area and you're into video production, you should really attend the monthly BOSFCPUG meetings. 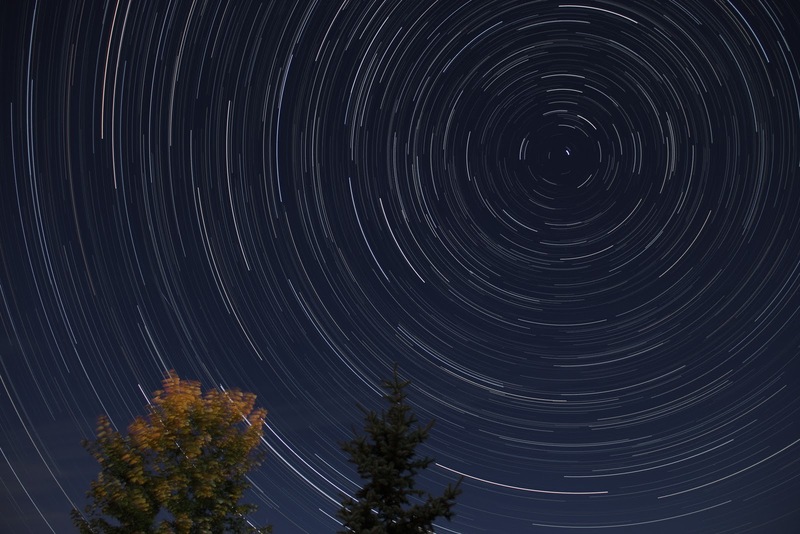 I'm taking a photography course through the Harvard Extension School, and it was quite fitting that star trail photos were suggested for this week's project, since one of my recent photographic goals was to take star trail photos. I'm a space exploration enthusiast, and star trails have always amazed me. Living in Boston makes it very hard to take such pictures, due to all the light pollution from the city. I recently took a trip to central NY, and figured that a weekend in the country would be the perfect time to take star trail photos. 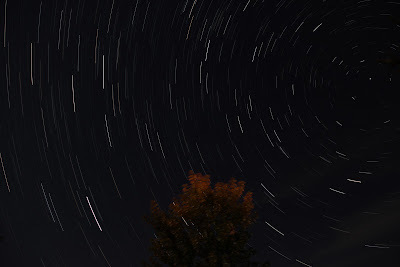 Preparation: After doing some online research about star trails, I purchased a wired remote for my Canon 60D. This allowed me to hold the shutter open for longer than 30 seconds, as well as take multiple shorter photos for stacking. I also purchased a tripod for this shoot. Conditions: I had two consecutive evenings (10/8 and 10/9) to take star trail photos. I knew that the first evening would be full of trial and error photos. The conditions were near perfect for taking star trails photos. There weren't any clouds in the sky, there was minimal light pollution from populated areas, and the temperature was in the 60's, so I really didn't run into any condensation on my lens. Even though I was out in central NY, away from heavily populated areas, light from houses and street lights still washed out sightings of stars right along the horizon. The timing of the moon phase couldn't have been worse though, since it was nearly a full moon. There was quite a bit of reflection of light off the moon lighting up the night. I could almost read a book out there with light reflecting off the moon. Positioning: After the fact, I figured out that it would have been best to drive way out into the country, far away from any houses or street lights. Instead, for this shoot, I was in the backyard of a house in a populated neighborhood. That added a bit of light pollution, washing out some star sightings. I set up my tripod with my back to the moon, to make sure that it wouldn't enter my shot as it moved across the sky. The moon is way too bright for these types of long exposures. I made sure to get the north star in my shot, so I would have star trails circling around it. Not essential, but a cool looking effect. I was able to capture many more stars due to the wider aperture, my digital noise was very low, I now positioned a tree in the frame for some reference, and I positioned the shot to capture the north star. Other than some slight blurring in the tree (the wind was slightly blowing) and some whisps of clouds on the bottom right, I was very pleased with the result. Stacking consecutive images definitely seems like the best method of taking star trails photos. My favorite part of this photo is a shooting star that I captured. If you find the highest point of the left tree, and move up the image you can see the shooting star as a small diagonal trail. It was easy to tell that shooting star apart from the airplane trails, since it started and stopped over only an inch of my image, rather than travel through the entire image. Conclusions: After trying a shot simply leaving the shutter open for 30 minutes, and trying the method of stacking consecutive shorter exposure shots, I would highly recommend the stacking method. There was much less digital noise and I was able to capture many more stars due to the wider aperture. I also liked the look of increasing the ISO to 200 for my second evening's shot. The increased sensor sensitivity allowed me to capture more stars and also gave the sky a slightly bluer look to it, rather than dark black. 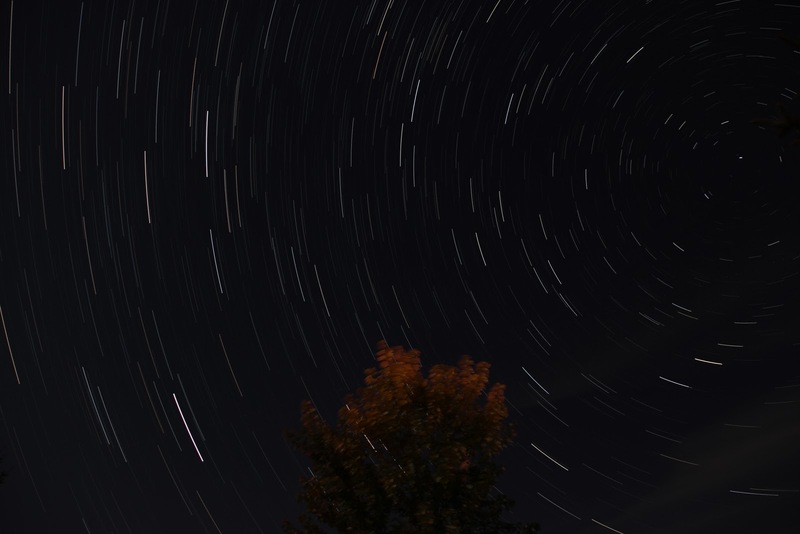 In the future I look forward to taking more star trails photos. I hope to try taking four hours worth of shots and try something a bit more exciting in the foreground, like a building.